Here at Douglas we have considerable experience of hotel and public/private building renovation and have been involved in many of the major London hotel refits. Many buildings have quality taps, showers, accessories, lighting and door fittings etc. which are suffering from years of wear and tear. 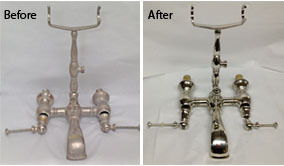 These fittings can be enormously expensive to replace (if they are obtainable), so why not refurbish? We can work together with building maintenance staff or contractors to bring all the fittings back to their “as new” condition whilst keeping disruption and room closures to a minimum. Why pay manufacturers and retailers for items you already have? Just because your items have lost there new shiny appearance does not mean you have to pay out fortunes to replace them. Many of these articles can be refurbished to “as new” condition or better, for a fraction of the “New Purchase Price”. Items like lighting, Taps, Showers, Bathroom accessories, Door handles and closers, Furniture hinges and handles, Signs, Kick plates etc. etc. Can all be refinished, the list is endless and we are constantly surprised by the articles customers send us.